Sourdough starter is a mixture customarily made with flour and water, yet can include other ingredients, such as organic grapes or figs. It captures the wild yeast present in flour to create a rising agent to be used in baking. It therefore replaces cake yeast, dry yeast, or other forms of baking yeast. You may replace sourdough starter for yeast or other rising agents, such as baking powder, in any recipe. You may need to play a little to find the right amount of sourdough starter needed, as much will depend on your starter’s potency. The result might not be exactly the same, but you can be sure it will be more healthy. Sourdough starter in French is known as levain. Most breads baked before the end of the 19th century were made with sourdough starter of some kind. Bread-makers started to use baker’s yeast only about 150 years ago. Since sourdough starter is alive, it must be cultivated and nurtured to keep it thriving. In short, this means you will need to feed your starter and create an environment that will protect your sourdough starter. Fortunately, it is relatively easy to feed and protect sourdough starter since it is very resilient. You can create a sourdough starter with two ingredients: flour and water. As you can imagine, it’s best to use organic flour and spring or filtered water to avoid any kind of chemical contamination. Let nature take its course. You can read below about sourdough starter recipes and the steps needed to create your starter. How Much Commitment Do You Need to Create and Maintain Your Own Sourdough Starter? You’ve probably heard it takes a lot of work and care to maintain a sourdough starter. Or you’ve read that you have to feed your sourdough starter at least once daily. It’s true, some bakers feed it two to three times per day. Ok, a baby or a dog requires about the same amount of care and attention, you might think. Are you ready for such a life-changing commitment? Be assured that the feeding schedule can be a lot less burdensome if you want, as you will read below. Remember all this effort is only to maintain your sourdough starter. Afterwards, it can take you between 18 and 36 hours to make a traditional sourdough loaf. Don’t fret, however, most of this time is passive. You can therefore relax or go about your life as the dough ferments and rises. Try this Trustworthy Sourdough Bread recipe to make a tasty sourdough bread time after time. 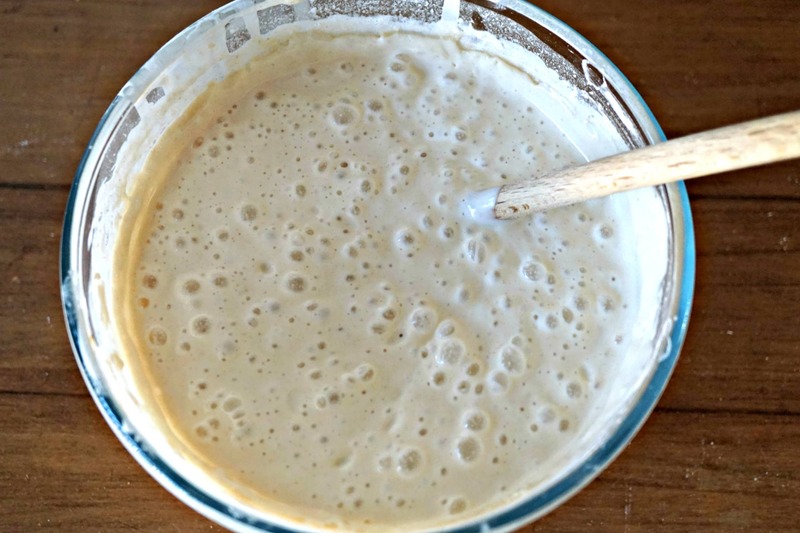 Why Create and Maintain Your Own Sourdough Starter? There is almost nothing as satisfying as baking your own bread from start. Using your hands to knead the dough, then watching your dough expand, and finally smelling the bread as it bakes in the oven is fulfilling on a primal level. Discover more reasons by reading A Guide to Making Bread at Home. Sourdough breads are healthier than faster-fermenting breads, as the sourdough starter breaks down the gluten, making it easier for people to digest and to absorb the nutrients. Many people who are gluten-intolerant actually tolerate sourdough goods made with wheat flour. Sourdough bread does not go stale as quickly as yeast breads. Your sourdough bread might get hard, but this can be fixed easily by putting your slices in a toaster or oven. Bread made principally or exclusively with rye flour, like many breads traditionally prepared in Northern Europe, need the slow-acting work of sourdough starter to get the dough to rise. Rye flour does not contain gluten and therefore needs extra help to rise and stretch. With sourdough starter, you can make all kinds of baked goods, including numerous kinds of breads as well as sweet baked goods, such as brownies, pie crusts, muffins, and cakes. Almost any flour recipe can be easily adapted to use a sourdough starter. How Do You Make Sourdough Starter? I’ve made sourdough starter several times using various recipes. The easiest one requires mixing only water and flour. Some recipes call for adding yeast, but this is not necessary. It will help kickstart your sourdough starter, yet purists would skip adding yeast. Other recipes suggest adding organic grapes or other fruit, such as figs, since they also have wild yeasts present on them. There are endless recipes. They all work. A couple months ago, I followed Nancy Silverton’s Grape Sourdough Starter recipe to create a new batch. Nancy Silverton is a legend in Los Angeles, as well as elsewhere in the United States, for having started and run a few eating establishments considered among the most popular in the Los Angeles. La Brea Bakery, Campanile (the predecessor to the now popular République on La Brea Avenue), and Osteria Mozza are a few examples of her ventures. What each restaurant had in common was its fabulous bread and baked goods. Nancy Silverton is credited with helping to bring fresh-baked artisan bread back in America. So when I found her Grape Sourdough Starter recipe it was an easy choice to make. I have since purchased her acclaimed book Nancy Silverton’s Breads from the La Brea Bakery: Recipes for the Connoisseur and would recommend it to anyone thinking about starting to bake bread. The only ingredients needed to create this wonderful sourdough starter are bread flour, water and organic red grapes. The hardest part might be finding organic red grapes, depending on the season. How Long Does It Take To Make a Sourdough Starter? Count on it taking you about nine days to create your own starter by following Nancy Silverton’s recipe. With other recipes you may need a few extra days. In general, within about two weeks, you should have sourdough starter ready to use. How Long Can You Keep Sourdough Starter? In Belgium, I created a starter that remained good about three years. I left my sourdough starter out on my kitchen table in an uncovered glass bowl with a cheesecloth fastened around the top with a rubber band. When I travelled, I put the glass bowl into my refrigerator to slow down the fermentation process, as you will read below. Leaving the bowl with only a cheesecloth as a cover let a subtle sourdough smell permeate my kitchen. I like the smell of sourdough starter. However, you can easily cover completely your sourdough starter and accomplish the same results. Sadly, I had to stop that sourdough starter when I moved to Los Angeles in 2016. Had I not left Brussels, I’m sure my starter would still be alive. Be reassured, sourdough starter can last centuries. Boudin Bakery has been making its famous San Francisco Sourdough Bread from the same mother sourdough since 1849! Feeding your sourdough starter does not require much time. Each feeding takes less than five minutes. All you do is add equal weights of flour and water to your sourdough starter, then mix and cover your container, either with a cheese cloth or with the top. You might have read that you need to feed your starter at the same time every day. Although this may be optimal, I have never been so exact in my feeding times. I try to feed my sourdough starter in the morning or in the evening, yet do not always feed my starter at the same time each day. The only monetary costs are for the flour and perhaps the water added. In Belgium, I successfully maintained my starter using tap water. Now I’m purchasing natural spring water to use for my sourdough starter to ensure its quality. Sourdough starters are extremely durable. It would take more effort to kill your starter than to keep it going. The starter’s culture environment helps protect it from infection from bacteria or other contaminants. No special materials are needed to store sourdough starter. You can use wide-mouth glass jars, such as mason jars, food-grade plastic containers free of BPA, or stoneware crocks designed for fermentation. I have used all of these with much success. There is no need to spend a lot of money on containers. Over the years, my Ball wide-mouth jars, especially in larger sizes, have come in handy for my fermentation projects, including sourdough starter, kombucha, red wine vinegar and kefir. Recently, I’ve been enjoying Anchor Hocking True Seal Glass Food Storage Containers. They have wide openings, which make it easy to feed your starter as well as remove some starter for use. Their lids secure the top tightly, avoiding any bad odors getting out or any bugs getting in. In addition, they are super easy to clean. Large Tupperware Bowls cups or a Dough Rising Bucket with Lid are lighter than glass containers and work just as well. If plan on keeping your sourdough starter on your counter and making bread often, you might wish to invest a little more to buy a stoneware fermentation crock. They are more attractive to be visible in your kitchen. In addition, their top keeps odors in and bugs out. You may also use your crock for other fermentation projects you might have. If you opt for a container without a lid, you should purchase some unbleached cheesecloth. It’s super cheap and reusable (after being washed, of course). Then all you’ll need are rubber bands to keep the cheesecloth attached on top. When you feed your sourdough starter it reproduces exponentially. Unless you use starter on a regular basis you will soon find yourself, like I did recently, with several large glass containers filled with sourdough starter. Slow your sourdough starter by putting it in the refrigerator. Your starter can stay a long time in your refrigerator. I’ve left mine in the refrigerator more than a month once when I was traveling. When I returned I just had to remove a crust that formed on the top. Making sourdough pancakes is one of my favorite ways to use extra starter. Pouring a ladle of sourdough starter onto a hot pan gives you wonderful tasting sourdough pancakes in a couple minutes! Surely, you can improve these pancakes by adding other ingredients. Adding a little baking soda, for instance, will make your sourdough pancakes more fluffy. An egg will also give a fluffier result. A little molasses or sugar will slightly offset some of the pancakes’ natural sourness. Fruit will make them healthier and more attractive. Yet, sourdough pancakes are yummy as they are, just plain. I often add honey or fruit jam on top of mine. Discover several new ways to enjoy your sourdough pancakes by reading Sourdough Pancakes – Sweet or Savory. You’ll find how to make Sourdough Pancakes with Gravalax, Banana Sourdough Pancakes, Blueberry Sourdough Pancakes, Sourdough Pancakes with Avocado and Tomato, and much more. How Often Do You Need to Feed Your Sourdough Starter? The feeding frequency for your sourdough starter will depend on your plans for using it. Think of your sourdough starter as a living organism. If you feed it once a day, it would adapt its activity so it doesn’t consume all its energy reserves before the next feeding. Whereas if you feed it twice daily it would become more active to digest the first feeding before starting on the second feeding. If you plan to make bread daily, you will need to feed your sourdough starter more frequently to ensure that the starter is active enough to enable the dough to rise daily. The more active the starter, the less time you might need for your dough to ferment (i.e., to rise). Bakers making bread regularly will probably keep feeding and using the same sourdough starter without putting it to rest in the refrigerator. The sourdough starter will thus be ready whenever they need it. Generally you should begin making a new dough with your sourdough starter when it’s time for its feeding. In this way, your starter will be hungry for the new flour and water and will immediately start feeding on these new ingredients to begin making a new loaf. If you do not plan to bake bread regularly (i.e, a few times per week), you can put your starter in the refrigerator in a covered container. The colder temperature will reduce the sourdough starter’s activity, making it less hungry for new feedings. Your sourdough starter will not die, but will merely sleep or hibernate. It’s recommended to remove your sourdough starter from the refrigerator every week to feed it once before putting it back in the refrigerator. You should let the starter sit on the counter for a couple hours before feeding it. Afterwards, let it sit again a couple hours before putting it back in the refrigerator if you do not plan on using it immediately. After removing your sourdough starter from the refrigerator for re-use, try to feed your starter at least three times at more frequent intervals before you make your bread. For example, try feeding it twice daily for the last three feedings to make sure it is active enough to make the dough rise. Don’t stress too much, however. I sometimes feed it only once before bread-making and get good results. If your starter is not very active, it might just take more time for your dough to rise. These recommendations follow general practice. However, as mentioned above, your starter is fairly durable and can survive changes in its feeding schedule. You will soon become an expert and will recognize the signs of when your starter is sufficiently active. Generally, it is active if your starter becomes bubbly and rises up into a foamy texture when you feed it. Below are an image and a video of a healthy sourdough starter. Hopefully, these images will help provide you comfort when you start wondering if you are making your starter the correct way. If there is little activity a couple hours after feeding it, it is not sufficiently active. In this case, it’s best to discard most of your starter. Then start feeding your starter more frequently for a couple days. During this time, you could also increase the amount you feed your starter. For instance, if you have 8 ounces (approximately 250 grams) of sourdough starter, you will feed it with the same weight (i.e., 8 ounces / 250 grams) in flour and again in water. At each feeding you will continue to increase the quantity, so you basically triple the weight of your starter each time. These steps will re-activate your sourdough starter after a few days. As mentioned above, when a sourdough starter starves, the mixture produces more alcohol. You might in this case see a dark greyish color liquid on top of your starter. In the sourdough world, this alcohol is sometimes referred to as hooch. To prevent it becoming alcohol, you just need to feed your starter in time and avoid it becoming starved. Don’t worry, however, if part of your starter has already become alcohol. You can simply discard the alcohol. With regular feedings you can then get your sourdough starter back on track. If your container is not covered tightly or with only a cheesecloth, a dry crust might build up on top of your starter. Simply remove this crust and begin feeding your starter again more regularly to re-activate it. Creating your sourdough starter is only the first step. Afterwards you will have endless choices on how to use it. See above for some examples. Review the 10 Tips for Working with a Traditional Sourdough Culture for more information on how to create, maintain and use your sourdough starter. Don’t overthink it. Although you can maintain a starter for years, you can also use it for only a few weeks to make some delicious bread and treats. Then when you are in the mood to make sourdough products again, you can make a new sourdough starter. What Other Recipes Can You Make with Sourdough Starter? I’ve been enjoying using my current sourdough starter to make sourdough bread that has a chewy crust and an airy medium-density dough. Recently, I’ve perfected this Trustworthy Sourdough Bread recipe for you to enjoy. Some other new dishes I’ve created using my starter include sourdough brownies and sourdough crust pizza as well as the Sourdough Pancake dishes mentioned above. The sourdough starter offsets some of the brownies’ sweetness, making it easier for you to eat double portions. The starter helps make the sourdough crust of a pizza a bit more chewy with a soft rise. Check back on this site to discover these new recipes. How Do You Share Sourdough Starter? Not only can you share with your friends bread, brownies and other goodies made with sourdough starter, but you can also share some sourdough starter so they can also enjoy making their own treats. Many people are curious about making sourdough starter, yet are intimidated by how difficult they hear it is. Help them by showing how simple it really is. It’s a lot less scary when someone’s leading the way. Please use the social media links below to start sharing the joy. I could never create sourdough starter and I tried at least two dozen times. I guess in my house the wild yeast is not that good. Later, I bought some dry San Francisco sourdough yeast and it worked like a charm. I am sticking with that. Also, for some reason the 50/50 method never gave me good looking starter, but 60 flour and 40 water gave much better results. Go figure. Whatever works, I suppose. Hi Victor, sometimes it just takes patience until the sourdough starter becomes active. Some people follow 50/50 by volume instead of by weight to get started. This means 1 cup water and 1 cup flour. Then to maintain they follow 50/50 by weight. For me, the sourdough starter does better when it’s a little thick (like thick pancake mix). If it’s too liquidy, there’s not enough flour to feed the starter. In the past, I’d sometimes adjust my starter by adding more water if too thick, or more flour if too liquidy to get the consistency that I wanted. Don’t be afraid to follow your instinct. Thanks a lot for your comments about the article! Thank you very much and I will let you know how it turns out. Hey Ron, I’d love to hear your feedback. It’s such a joy having your own starter. It can last for years. Hi,I very much enjoyed reading your article,as I would like to try out baking sourdough bread. I’ve got a question and I hope it is not a stupid one…my daughter needs to eat only glutenfree bread in order not to get ill. Is there any chance to create sourdough bread with glutenfree flour? Hello Heike! Your question is very logical. Yes, you can make sourdough starter from gluten-free flour made from grains. I’m not sure, for instance, about coconut flour which is not from a grain. It might take a little longer to get the starter going, but just remain patient. Depending on the flour you use in your starter, when you make your bread it may be a bit more dense bread. You may therefore have to add other grains that might make your bread lighter. For instance, oat flour helps give a lighter result. Or when preparing your dough, add a little baking soda, buttermilk or other alkaline-forming ingredient that will act as a catalyst to activate your fermentation process. You may also need to experiment with rising times. Certain grains may take longer to rise or may rise less than others. Again, be patient while your dough rises, as it may take more time. Please share your feedback when you experiment with your gluten-free sourdough starter. Happy baking! Have you or anyone you know used milk instead of water for the starter and how did the bread turn out? I use this for pancakes but the bread has been a challenge. Hi Sara, you can use milk products in your sourdough starter. I had one starter that survived a few years, in which I added sometimes yogurt, buttermilk, milk, kombucha, and water or milk kefir. I also regularly varied the flours to feed it. I personally like a tangy sourdough starter that comes with adding the above items and rye flour. Be careful not to add too much rye flour as it will effect how much your bread will rise. Don’t worry about adding milk products to a starter, as your starter is a hostile environment for most microbes. New microbes (from the fat in your milk products) would probably not survive there. But if they do, they’ll be quite similar to ones already existing in your starter. Sourdough starters are very resilient. They can survive not being fed for a long time. The starter’s environment makes it difficult, but not impossible, for mold to affect it. Good luck and let me know how it works out. I just started a milk starter about a month ago, but mine also has sugar each feeding.Im new at this and just followed instructions, can this starter be used for your bread or do I start with a new one? Hello again, Mady. You can use your starter with my recipe. The result will be a bit sweeter and the crust will probably be softer. Your starter seems better for sweeter softer breads. Hi there Brad, I have another question.Can you leave the starter at room temperature period.and if so how often does it need to be fed. My milk and sugar starter stays on the counter, gets stirred every day and fed every 5 days..
Can the same be done with the grape starter? Very nice post Brad. Starter is pretty resilient once you get the hang of it. Love all of your ideas for using discard. Thanks, Karen! Let me know if you have any questions. I can’t wait to try your Liège Style Waffles http://www.karenskitchenstories.com/2017/03/liege-style-waffles.html#more Your recipe looks so authentic! Thank you for the starter! I am going to get it out of the fridge now and let it come to room temp and feed it! Watch out, Dorothy, it will come alive! Just like the old movie “The Blob”….it keeps growing. Fortunately, you can also eat it. Enjoy! Thanks, Christina, for your kind words. As you begin feeding your sourdough starter, please share your experiences and questions. I’ve began my starter 3 days ago. Can you tell me does the starter have a sudden rise when created? I noticed my glass bowl has a crust as though the starter rose and fell. Hi Pat, yes your starter should rise and fall during the creation phase. Have you been feeding it? Mixing it? What sourdough starter recipe did you follow? What are you using for your cover? Hi, Tammie! I’m so happy to read you’re embarking on a journey of making sourdough bread. It’s very exciting. Don’t be intimidated. Your sourdough starter, once started, is very resilient. I’d be happy to answer any questions you have along the way. Please keep me posted on your progress. Thanks! I am having a book club dinner where we willbe discussing The Great Alone . I want to make sour dough bread and share the starter with 6 other people. How much starter do I give them and what do they need to do at home? Thanks so much! Hi Susan, so funny because I was just talking to a good friend who is also reading The Great Alone for her book group. She’s loving it. For sourdough starter, you can fill up an 8 oz jam jar for each of your friends. Read the section “Maintaining and Caring for Your Sourdough”. If you use the sourdough starter regularly, you can feed your sourdough starter once a day. Many people double the weight of the starter at each feeding. This means if you have 8 oz (measured by weight, not volume) of starter, you would feed it 8 oz (by weight) of flour and 8 oz of water so you end up doubling the amount of your starter. As you can see, the sourdough starter multiplies quickly so it’s important to use it or put it in sleep mode by placing the starter in the refrigerator. Let me know if you have any questions. Where is the recipe for the starter? Hi Carolyn, there is a link in my post to the recipe. Here it is again in case you can’t find it. Let me know if you have other questions. Thanks! Thanks for the response, but I still don’t see the recipe. Many tips and excellent explanations about maintaining and using the starter, but no recipe. Am excited to begin sourdough adventure. I use a glass bowl, plastic whip, unbleached flour and distilled water. Works every time. Hi Linda, what do you mean by “plastic whip”? To use to stir the starter? I also use a glass bowl, unbleached flour, and natural spring water. I use a wood spoon or a plastic spatula to mix the new flour and water into the starter. Thanks for your response. What is the recipe to use organic grapes. How do you incorporate them into the flour and water. Leave the whole, cut them in halve, crush them? Very informative article. I absolutely love sour dough breads! Janet, here’s the link for the recipe: https://www.geniuskitchen.com/recipe/nancy-silverton-s-grape-sourdough-starter-316306?soc=socialsharingpinterest I just wrapped them in cheese cloth and then crushed them a bit to open them up. Then I placed the filled cheese cloth into the flour-water mixture. All very simple. The most difficult part at some times during the year is finding ORGANIC red grapes. Now should not be too hard. Please come back and share your experience with us. Thanks! Thanks for the reminder, my Dad used to make sourdough bread and pancakes every winter. He’s been gone about 10 years, and was unable to cook about 5 years before. I missed it, and have tried to buy “sourdough” bread, and how disappointed was I!!! It wasn’t true sourdough, but bread recipe with a little vinegar in it. As for the history of sourdough in this country, it was actually a settlers recipe when this fantastic country was being settled!! Would make sense it started in Europe, where most of settlers came from. Cowboys used to be fed sourdough on cattle drives. Amazing how the best keeps coming back to us! Thanks, Connie, for sharing your memories and this information. I’m so happy that this post could move you. Hello Kim, you ask a lot of good questions. I have made rye sourdough starter. It has a more distinct flavor. It’s more sour than regular sourdough. Many people add some rye flour in their sourdough starter to give the starter a stronger, deeper flavor. If you don’t tolerate gluten, you might try adding some unsweetened yogurt into your dough when you make it. The alkaline in the yogurt will help give your starter a bit of a boost. The same with a little baking soda. I would suggest adding the at the sponge stage. In the past I’ve added yogurt to my sourdough starter and it survived ok. But to start, I’d recommend adding it separately at the sponge stage. You can also try to add flour made from non-gluten grains to mix with your rye when you make your bread to help it be less dense and to give a less strong flavor. I have added flour from lots of different grains in my sourdough starter. Each adds flavor. But you can also keep your sourdough pure with rye and then add other flours when making your bread. I hope you will experiment and let me know your feedback. Don’t be intimidated. Thank you! I’m so happy to hear this, Maz! Share your feedback when you begin making bread from your own starter! What other things can be used in your starter besides grapes or figs? I once saw a cooking show that suggested apples. Should all the ingredients be organic? Hello Andrea, when making your starter it’s best to use organic fruit. As the starter is alive, it helps to feed it with healthy ingredients that will continue to nourish you as it multiplies. I’ve made starer from only flour and water. Fruit is not absolutely required. Yet many fruit have natural yeast on their skins (so don’t peel them). I would think apples would work too. Please come back to share your feedback. Thanks! HI- new to this- is the starter made with warm water or does it matter? Is the feeding also equal parts water / flour? Hello Tina, when you feed the starter you’ll add equal parts (by weight) of water and flour. From time to time if the starter looks too thick, you can add a bit of water to get back the consistency of a thick pancake batter. Likewise, if too thin, you can add a bit more flour. Adjustments to restore the consistency you want is perfectly fine. Sourdough Starter is fairly resistant and will survive most mistakes re: feeding that you might make. Don’t sweat the timing of feedings too much, except the day or two before making bread with your starter. Let me know how it works out for you. Thanks! ok, you say to leave it on the counter, fine I understand, but I always have my air conditioner on and it’s super cold in my entire house is this going to be a problem? Hello Lucille, the air conditioner or cool temperatures will slow down the growth of your starter. It will make it less active, but will probably not kill it. You can try to find a place more sheltered from the AC or cover the container with a towel to protect your starter from the cooler temperature. Good luck with your starter! Thanks! Thank you, I thought about covering it with a towel or putting it in a closet . I’ll try and see what happens thank you so much . I live in a humid area (Texas) and I find that after a week on my counter and regular daily feedings, it starts producing mold. Any suggestions? Hello Ann, how are you covering your sourdough starter? You can close a lid over the container. I used to cover only with a cheesecloth and rubber band. Now, I keep my starter in a glass container with a tight-fitting lid. If it’s too warm or humid, try putting your starter in the refrigerator when not using it regularly. Leave it out about 36 hours (more or less 3 feedings) before using it to make bread. Mold can also grow if your container is dirty or the ingredients are not clean. For instance, try using spring water if you are currently using tap water. Make sure that the rim of your container is clean after feeding or using your starter. Hope these tips help. Thanks so much! I love your blog and am learning a lot from it. Thank you so much! I have been feeding my starter daily and bake often. My starter has a thin white crust which forms on top daily. I think it smells fine – but I just wanted to know if this is normal or not. One time I skipped a day of feeding and mold formed on top – so I threw out the whole thing and started again. I live in Chiangmai, North of Thailand and perhaps it’s too warm and humid here? Although, winter has just started and it has gotten so much cooler and drier as of yesterday! So, I am hoping for better results in my starters and bread making. Another question that I would like to ask is, if you have any recipes that calls for a lot of butter, such as croissants and babka that I can use levain instead of dry yeast? Hello Virginia, thank you so much for your super kind words. The starter may have difficulty staying fresh in such humiidity. I would try keeping it in the refrigerator during periods you are not using it. When you have it out to use, you can keep it in a covered container. The sourdough starter can survive in a glass container with a sealed top. Hello from an other Belgian.very interesting read.I am reasonably new at making a starter, about one month.mine was made with milk, flour and sugar. I have made a couple of sweet breads with it, they were delicious, then I tried some buns but that was a disaster. I have a couple of questions, can the bread maker on dough setting be used for mixing the bread? And can my milk starter be used for your bread or should I try with a new water mix starter? Also I don’t know why they used so much sugar but being new I just followed the directions . Hi Mady, thanks for your questions. Milk and sugar sourdough starters are better for sweet breads. You can transition your starter over to a water-based starter merely by starting to feed it equal amounts of flour and water, without any added flour. If you don’t want to change all of your starter over, try beginning with a portion of your milk-based starter to see how it goes. By reserving some original starter you can always go back to it if you prefer. Alternatively, you can start from the beginning with a new water-based starter. I’m sorry I’ve never used a bread machine so cannot help you there. I would imagine though that they have a setting that allows you to mix the dough. Let me know how it works. I have had some “better for bread” flour in a oxo air-sealed container for a long time. Can I use this flour to begin a sour dough starter. I don’t know how long flour stays good to use. Hello Joyce, good question. Since you want to benefit from the live yeasts that might exist on the flour, it’s better to use fresh flour if possible. Unbleached flour is preferable. Smell the flour to determine if it smells rancid. If so, throw it out. White flour will last longer, if stored properly in dark dry space, than whole grain flour. If you wish to make a sourdough starter that could serve you for years to come, best to begin with quality ingredients. It will pay off in the long run. Good luck! I just started making sourdough rye bread. It’s confusing at first; starter,sponge. You have to dive right in, give it a chance. Trust your own instinct. I am having so much fun! The house smells so good. I’ve actually named my starter Bubbles! After all, it needs care and feeding! Hi Jamie, I love that you gave your starter a name! Sourdough starter is fortunately so much more resilient than we sometimes think. I hope you enjoy many more times making bread. Great post – thanks for this! I recently posted a blog on my website about the benefits of making your own bread in the traditional French way. Can’t wait to prepare my starter following Nancy’s recipe! Thanks, Kelley! I can’t wait to read about your experiences with sourdough. Please keep me up to date with your progress!